Mid-Life Cruising!!! 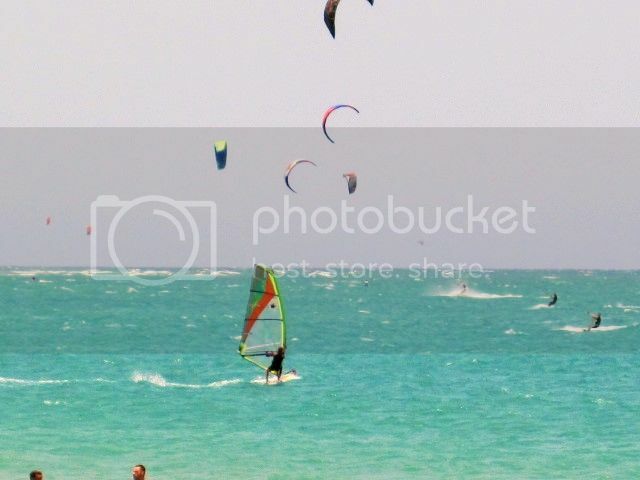 : Cabarete, Kite Surfing Everywhere! Our first view of Kite Beach ... it awaits! After white-water rafting the day before (post coming soon - my daughter has all those pics), we decided to take it easy today and visit Cabarete. 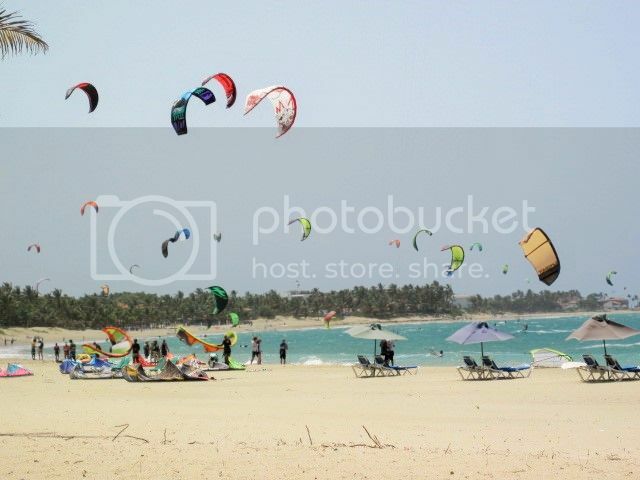 Cabarete is a beach town that is known for having a hippie vibe and more importantly ... kite surfing! With great conditions for the sport, Cabarete is the place for annual competitions, training, and for trying out new equipment. In fact, it seems to be a great place to buy "last year's" gear. About an hour east of our resort, we needed transportation. We weren't sure, but it seemed that the local "Javilla Tours" bus wouldn't take us there and we'd need to really live like a local and take the guagua. The guagua is simply a minivan, and a popular mode of transportation for the locals. We grabbed the first guagua right outside of our resort, which took us to downtown Puerto Plata. We were the only folks on the guagua, but from our experiences in Mexico ... we knew we were lucky. After being dropped off, we were immediately approached by a guy speaking Spanish and waiving us into another guagua. I wanted to know where we were going before getting on, but the rest of the family piled in before I could say anything. I reluctantly stepped into the van .. hoping we'd wind up in the right place. 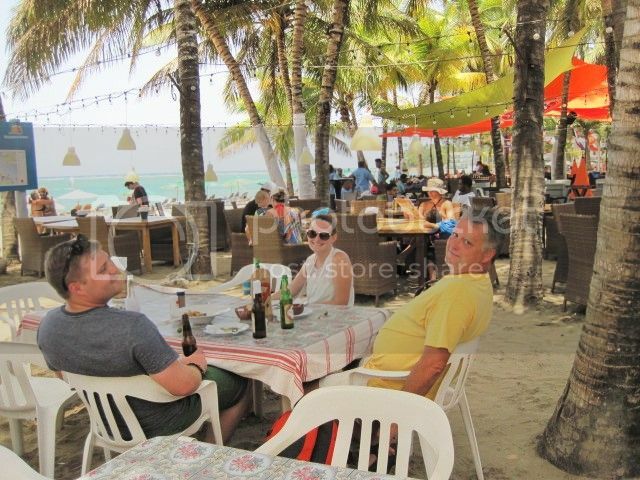 We arrived in Cabarete, but we weren't the only folks this time. I was lucky and grabbed a seat right by the sliding door, which never closed and allowed some ventilation. The rest of the family ... not so lucky. They were wedged in the back of the van, and things got tighter and tighter. I couldn't help but chuckle as we picked up number 20-something ... I'm not joking! At one point, there were guys standing in the doorway, holding on and hanging out of the van. I knew our kids were probably cursing us, and wondering what the heck we've dragged them into. Yep, I had to remind them that we were on an "adventure"! Anyway, they were good sports and we never felt unsafe .. just cramped! Heck, it was about a dollar a person each way versus the cab fair of $50 bucks each way. I think the "adventure" was well worth the savings! As we unfolded out of the guagua, the picture above was one of our first views of the Cabarete beach ... looked good to me! 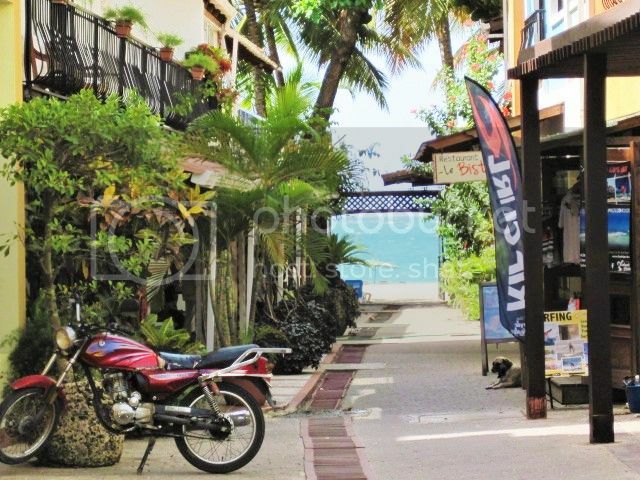 I really love this picture ... it provides a peek of the beach, along with surfing shops and of course, the "concho" (motorbike). If you didn't read my first post about the Dominican Republic, you may not know that conchos are everywhere! Below is the view of the main street. Just as conchos are all over the road, kiteboards are all over the beach of Cabarete. When we walked onto the beach, it was beautiful .. a sky full of colorful kites, but so quiet! The beach and the water were also pretty ... much nicer than at our resort. Along the beach there are all sorts of restaurants and bars, so we grabbed a chair and ordered a few Presidente beers. I bet this place is really cool at night too! We watched the kiteboards and windsurfers do their thing, and we wished we could take lessons. Ken talked to one of the many trainers and learned that we'd need at least six hours. Looks like we'll have to wait till we're living on our boat to have that kinda time! I really don't think that I'd need six hours to learn. The first time I tried to get up on water skis as a child ... got right up. Wakeboarding ... got up the first try after watching Ken and another guy try over and over again without success. Surfing, kiteboarding and/or windsurfing ... I gotta try it! 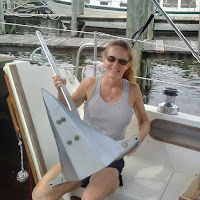 Some of the folks on the water were just learning, and others were obviously experienced. 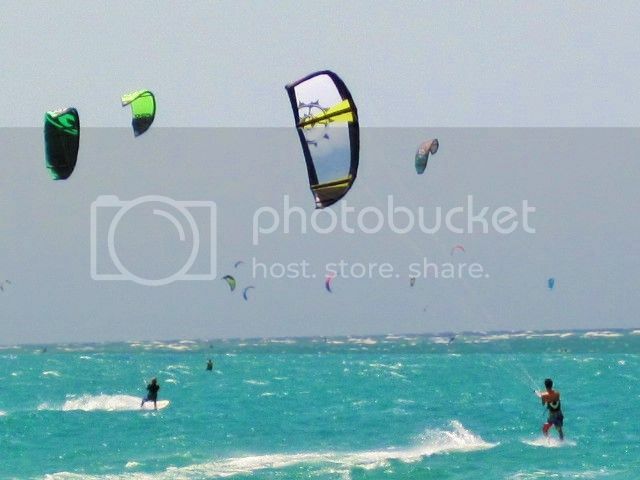 It was fun watching kitesurfers being pulled across the water .. and off the water! We spent the day relaxing, cooling off in the water, and drinking more beer. Before we knew it, it was guagua time! The ride back wasn't quite as cramped, but we promised the kids that the "Travilla Tours" bus would get us to everywhere else we needed to go. 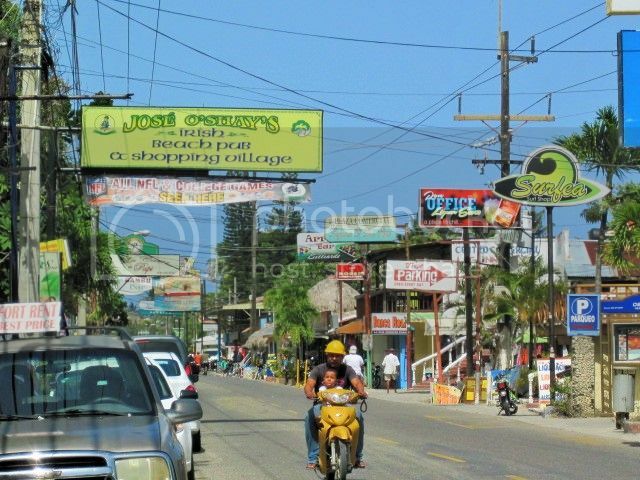 While we really enjoyed our visit to Cabarete, I will say that the local vendors were more than annoying. 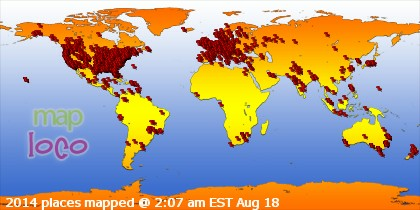 While they were extremely nice and polite, they came buy every 10 minutes! They must work for a company, because they had the same shirts on, the same briefcase, and the same souvenirs to sell. We know that they're just trying to make a living, so we were always polite ... but it was non-stop. The area seemed more "touristy" than we'd imagined, and therefore a bit pricier too. However, I think Cabarete is well worth the visit if you're in the Dominican Republic. The next day ... concho riding in Luperon with locals and cruisers ... stay tuned! The vendors drive me crazy! I know they're just trying to make a living, but it sure is annoying. 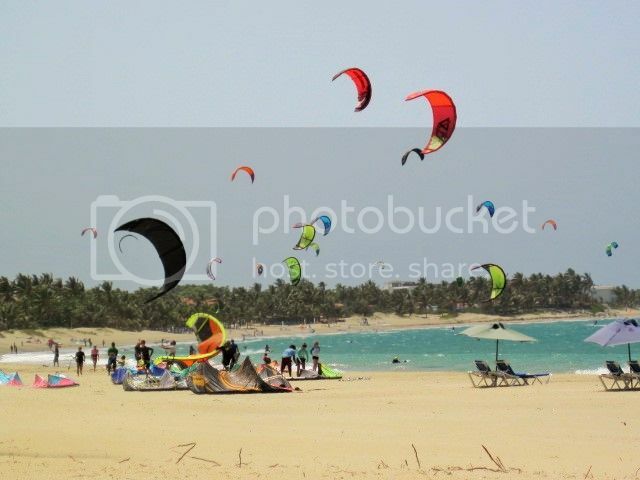 Love your photos of all the kites. So pretty! It's amazing they don't get all tangled up with so many kite boarders in a small area.